What is the Value of an International Internship in Today's Job Market? AIESEC USA Member Committee Vice President Laura van Jaarsveld and Outgoing Exchange Assistant Cindy Chen talk about the "best kept secret" for today's young job seekers. An international internship via AIESEC.org can involve work in Information Technology around the world. Photo courtesy of AIESEC. It's no secret that young workers in North America are still dealing with an unemployment crisis in recent years. According to the latest population survey (7/2016) from the United States Bureau of Labor Statistics, the total youth unemployment rate broken down by gender and race for those between the ages of 16 and 24 sits at 11.5%—more than double the rate for all other age groups. Moreover, that figure does not include youth who are underemployed, such as recent college graduates who cannot find jobs that actually utilize their skills and qualifications. You would expect that upon graduation from a great school, with great grades, and great skills, that there would be a plethora of jobs waiting. But that is not always the case. As a volatile economy where many new jobs are not high-paying or require low skill-sets continue to deter employers from increasing hiring, the result is intense competition for relatively few jobs. Without a wealth of work experience to list on a resume/CV, young graduates are often the last to be considered for vacant positions. It's a catch-22 that poses a challenge to nearly all young workers at some point or another in their job search: figuring out how to gain work experience when they can't actually get hired. For many job seekers, an internship is the perfect solution. Internships, which are either unpaid, or offer a small stipend to cover the intern's living expenses, represent a trade-off for both employer and intern. The employer is willing to take a chance on a young, potentially inexperienced candidate without the possibility of a significant financial loss. In turn, the intern can obtain the work experience necessary to move forward with his or her desired career. However, with several cohorts of recent graduates vying for internships across the country, even internships are becoming more and more difficult to secure. Many young job seekers are starting to see the value of going abroad to gain work experience, both as a means of setting themselves apart from the millions of other interns out there and gaining a window to another culture in an increasingly interconnected world. That's where AIESEC comes in, according to Laura van Jaarsveld and Cindy Chen, who are both serving terms of office on the AIESEC United States Members Committee. In an exclusive interview for the TransitionsAbroad.com website and webzine, they explain what AIESEC is and how it can help today's young job seeker. International internships are a win-win situation. Photo courtesy of AIESEC. "Given the current job market and high unemployment rates in North America, we believe it's more important than ever to set yourself apart as a job seeker," highlights van Jaarsveld. "That's why our current campaign for AIESEC member recruitment is actually 'Differentiate Yourself.'" "The difference that we're offering is a cultural experience," van Jaarsveld identifies. "We promote exchanges with countries that have cultures that are different from ours in North America. It's a three-tiered thing: you can see a different part of the world and truly understand their culture, you can develop as a human being, and you can develop as a professional." "A domestic experience is great," she goes on to explain, "but in this world of constant globalization and different projects happening in different areas of the world, it's even more beneficial for companies to have someone who has had an experience in say, an up-and-coming country, such as China or Brazil. International work experience can really set you apart from the thousands of other people that are applying to that one position." For those interested in differentiating themselves through an international internship, learning a little bit more about AIESEC is a good point of departure. An international internship with AIESEC is a way to differentiate yourself for future employers as well as being a great form of experiential learning and living abroad. Photo courtesy of AIESEC. "AIESEC is the world's largest student-run organization," van Jaarsveld points out. "It's been expanding ever since it was born. It started with seven countries. When I joined AIESEC in 2011, we were in 110 countries. Then at the end of last year it was 113 countries—now we're at 126. So there are a lot of countries and territories that AIESEC has been expanding into." Indeed, since AIESEC was founded just after World War II in 1948, it has achieved an impressive presence in countries around the world. Run entirely by students and recent graduates of educational institutes, it's non-profit, non-political, and self-sufficient. However, for an organization that realized 257,079 exchanges in 2011, they maintain a relatively low profile. "Yes," agrees van Jaarsveld. "We consider ourselves the best-kept secret in the world." Is AIESEC More than the Average Work or Volunteer Abroad Organization? AIESEC's mission statement is one that envisions "Peace and fulfilment of humankind's potential." However, on a more pragmatic level, AIESEC is about experiential leadership development. Van Jaarsveld explains, "We offer students and recent graduates the opportunity to develop themselves at their campus or through one of our exchange opportunities." They don't consider themselves in the same category as other work or volunteer abroad organizations. "Most of the work abroad programs out there basically hold the participant's hand step-by-step, so that the participant feels more secure," indicates Chen, "whereas AIESEC is a program that gives you a lot of freedom." The biggest difference, according to Chen, is AIESEC's focus on personal growth. "We really want to work on personal growth and that won't happen if it doesn't come from the participant. If they decide to step out of their comfort zone and do something more, there is always a safety net to help them expand their experience. But ultimately, what comes out of this experience really depends on the participant themself." The "safety net" that Chen refers to is actually a team of student volunteers from the local AIESEC chapter in the host city. Instead of having a tour guide or trip leader, exchange participants are offered the opportunity to interact with someone their age, who can offer them that "insider's glimpse" of the city or country. As van Jaarsveld indicates, AIESEC does not offer a structured work abroad program. 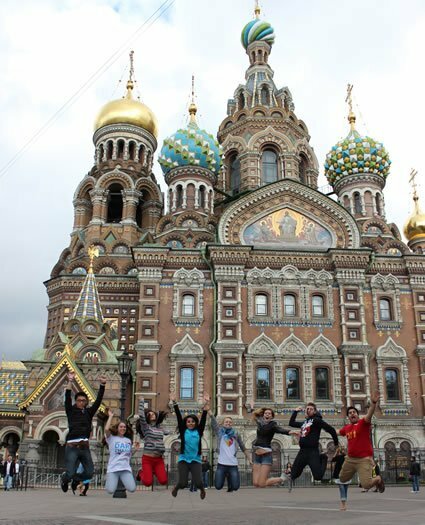 "Most study or work abroad programs would come with a fixed itinerary," she explains. "But what we have is a fixed job description and then once you get there, if you feel like you want to be challenged more or to see something during the weekend, there's really that option to be very proactive about it to make the best out of your experience." A presentation on the reasons to go an international internship. Photo courtesy of AIESEC. AIESEC groups its exchange opportunities into three broad programs: the Global Talent Program, the Global Volunteer Program, and the Global Entrepreneur Program. The Global Citizen Program is geared towards volunteers who wish to broaden their awareness in one of four areas: entrepreneurship, cultural awareness, community development, and environmental issues. These internships run for up to eight weeks, often during standard summer or winter breaks in North America. They are typically unpaid, although many offer housing arrangements or provide meals. According to van Jaarsveld, there is no shortage of volunteer opportunities with AIESEC. She estimates that there are approximately 20,000 currently in the online database and participants are not restricted to choosing just one, "You can go on multiple internships. I know someone who went on a year of volunteer projects. So he lined up [one] experience after another and went to all continents." The Global Talent Program offers a longer-term opportunity for exchange participants to develop themselves both professionally and personally. Most of the internships available are paid, whether it's via a stipend for living expenses or an actual salary. Exchange participants, or EPs, usually opt for internship opportunities that correspond to their field of study or their future career path, be it education, marketing, IT, business administration, or engineering. Says van Jaarsveld, "We see that there's a lot of demand for students in those areas, but there's also quite a lot of supply." As for the scope of professional internships available with AIESEC, van Jaarsveld reveals, "There are currently about 8,000 internship opportunities on aiesec.org." Although there is competition for internships, especially for those with big name partners such as Google and Microsoft, she is optimistic that there is something out there for everyone, "Anybody who has the motivation and knows what they want can make it to that position if they want to." According to Chen, the first step in going on exchange with AIESEC is contacting the local committee. You can find the closest committee by using the logging in on to AIESEC or by filling out the online form. Says Chen, "After that, an interview will be set up between one of the leaders of the local committee and the EP." The selection process for EPs is based on AIESEC's global competency model. Relates van Jaarsveld, "Some of the things that we look for are, is the person global-minded? Are they a proactive learner? Is this person motivated to embark on this cultural experience and make an impact, both in their own life and in the community that they want to work in?" Chen goes on to explain the next steps: "If they pass the interview, we give them access to aiesec.org, which houses our database of internship opportunities. Through the database, EPs will be able to find different traineeships that fit what they want to do and the countries that they want to go to. These are called forms. After that, they would ask for an interview with the company. If they pass the interview, they will go on to sign a contract with the company. Once they are in the host country, that's called 'realization.'" With so many internship opportunities available, many EPs end up wondering how to best narrow down the search. There are several key factors to consider when searching for an internship abroad. Although they do not discourage participants from doing exchanges in countries with similar cultures, taking exchange participants out of their cultural comfort zone is one of the main goals of the program. Says van Jaarsveld, "When we promote our internship opportunities, we tend to focus on different areas of the world to really provide that cultural experience." Many participants inevitably search the database with a specific country or area of the world in mind. However, as van Jaarsveld points out, it's important to focus on the professional development that you are seeking and remember that availability will vary from region to region, "For example, teaching English is very popular in Eastern Europe, Southeast Asia, and Central and South America. There are different areas of the world that just have higher popularity because of the demand in those societies." In today's economy, many students default to internships when they cannot find jobs or they are between degrees. However, as many interns come to realize, working for little or no pay isn't an entirely sustainable lifestyle in the long-term. AIESEC recommends internships that are within the timeframes that they offer: six to eight weeks for a volunteering internship and six months to one and a half years for a professional one. Says van Jaarsveld, "This is just what we've found to work best throughout the years and years of experience conducting exchanges. For our professional internships, five or six years ago we used to recommend going for only three to four months. But then companies and interns started realizing that when an EP came in, the training time would be longer than the actual working time. Eventually, it increased organically it from six to 18 months." Interning abroad is also about finding the ideal balance between working, taking in the local culture and attractions, and traveling when possible. Explains Chen, "Our volunteer internships are usually much shorter than our professional internships—but the work hours are often less, to allow Global Citizen Program participants to explore the area within the timeframe they have." Are the internship dates flexible? What is the cost of living in the host country? Will you be able to live on the salary/stipend provided? Can the host country accommodate any special needs (e.g. dietary, religious, medical, etc.) that you may have? Will your boss allow you to take time off if you want to travel? What are the daily working hours? How many days per week will you have to work? Van Jaarsveld has one piece of advice for EPs: "The more you put into it, the more you get out of it. If you're just there to do a job from nine to five, it's very similar to what you would do if you stayed here in the United States. At AIESEC, we ask you to step outside of your comfort zone—to really make sure that you go the extra mile to make the best out of your experience. So being flexible, understanding that there's more to it than just the position you're flying to the other side of the world to fulfill, that's what will make it the best experience possible." "It's about taking opportunities," agrees Chen. "When I was in Taiwan, I was interning as a teacher's assistant. But I wanted to get more out of it, so the teacher agreed to let me substitute teach for her when she was away. So instead of just being the assistant, I also got teaching experience." Going on an internship with AIESEC is not a guarantee of success in your chosen career path; however, it is a promising start. AIESEC alumni have certain advantages that others don't, says Chen. "In the U.S. we have an alumni organization called AIESEC Life." Van Jaarsveld explains, "AIESEC Life is this hub where alumni can go and see different job opportunities available with our company partners. Companies know that the AIESEC experience is very valid and they want to hire someone who has this experience and can bring something to their company." She states that interns also often use their experience as a stepping-stone into an organization, "We have a lot of the big names as our national and global partners. Many people are able to secure jobs with the same company in their home city or country. From the company's point of view, it's a very easy recruitment process, because they already know the intern and their strengths and working style. Of course, when a company isn't in the EP's hometown or country, there is always the possibility of staying abroad. "A few years ago we had an EP who went to Japan from our local committee," Chen recalls, "and after his internship he was given an open-ended job offer with the same company for the next ten years. So he could go back any time within the next ten years and he would have a job with the company." If you're interested in interning abroad with AIESEC, the first step is getting in contact with your local committee, visit the AIESEC internship website. Carly Vandergriendt is a roaming freelance writer, back on Canadian soil after spending a year sipping chai at roadside stalls, crashing Indian weddings, getting pooped on by pigeons, and arguing with rickshaw-wallahs and while experiencing an internship in India with AIESEC.